Easy to install and use; the many benefits of fingerprint biometrics start here. The U.are.U 4500 Fingerprint Reader is a USB device, built on the latest optical fingerprint reader technology. Its compact and attractive design conserves desk space in enterprises, its professional modern appearance looks elegant in point-of-service environments, and its ability to read a fingerprint from any angle makes it ideal for applications where users share PCs. The U.are.U 4500 Reader is a USB fingerprint reader featuring an elegant, sleek design with a soft, cool blue glow and, of course, the unsurpassed performance DigitalPersona is known for. Made for power-users and shared environments, the 4500 is the natural choice for those that want and need the very best. THIS MODULE SHIPS WITHOUT A CABLE. To order a cable, contact sales@fulcrumbiometrics.com or call +1(210) 257-5615. Have a question or need more information? Tell us about it and our personnel will respond shortly. (1) These operating systems are supported by Neurotechnology SDKs. Device manufacturers may have different lists of supported operating systems. 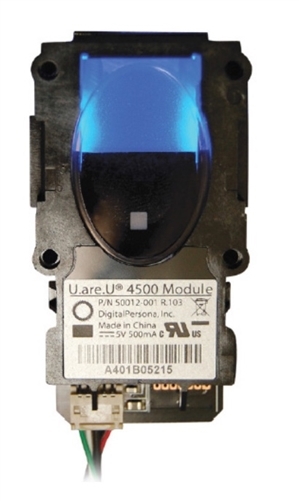 The U.are.U 4500 OEM Reader is compatible with many different software development kits and applications. Below is the list of products that are currently known to support this scanner. Please note that some applications and development kits require specific versions of the drivers to be installed. Please contact us if you need additional information. Age - As people age, they lose collagen which makes their fingerprint harder to read. Occupation - Manual laborers can sometimes wear down fingerprints on one or more fingers. Ethnicity and Gender - Some women and ethnicities have very faint fingerprints. Environment - Extremely dry environments cause fingers to become dry. Hygiene - Frequent hand washing or use of hand-sanitizers can dry out the skin, making fingerprints harder to read. People with difficult-to-read fingerprints may wish to press slightly harder, hold their finger on the reader slightly longer, touch their forehead before touching the reader (skin oils aid in readability) or register and use one of their other fingers. The fingerprint reader, while tolerant of residues left on the reader, performs optimally when kept clean! Do not pour any liquid directly on the reader window. Do not use alcohol-based cleaners. Never submerge the reader in liquid. Never rub the window with an abrasive material, including paper. Do not poke the window coating with your fingernail or any other item, such as a pen. Most of the unique, repeatable fingerprint information is located in the "pad" of your finger, not in the "tip". Flat finger placement as shown below will result in fast and accurate fingerprint authentication. Blue LED Soft, cool blue glow fits into any environment. Provides a pleasing presence; doesn't compete in low light environments, such as restaurants, or conflict with alarm condition colors, such as in healthcare. Small form factor Makes it easy to integrate into devices. Rotation invariant Touch it from any direction, it still provides a high quality image and matching performance, perfect for shared environments. Excellent image quality High-quality optics ensure best image every time. fingerprints Reliable performance over the widest population of users. Reads even the most difficult fingerprints. Thank you for your prompt delivery. I was able to resolve the problem with the bio reader you provided. Works great. Easy install and setup. No problems at all.